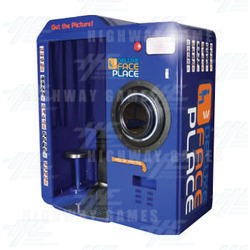 Face Place Deluxe is a photo booth from Apple Industries. It dispenses four (4) 2" x 2" traditional photo strips, or can be set to print an additional top or bottom frame for use with advertising campaigns, custom marketing messages or company logos. The machine is perfect for high-volume usage as prints take just 15 seconds to print. This model comes with (4) Photo Customisation Programs: Colour Strip Photos, Black and White Photos, "Fun Hair Styles" and "Fun Backgrounds & Borders", which allows users to add custom photo borders, backgrounds, funny faces, etc. Face Place Deluxe is a photo booth from Apple Industries. It dispenses four (4) 2" x 2" traditional photo strips, or can be set to print an additional top or bottom frame for use with advertising campaigns, custom marketing messages or company logos. The machine is perfect for high-volume usage as prints take just 15 seconds to print.